Mission San Buenaventura Historic Park is a collection of historic and archaeological sites, both public and private, adjacent to Mission San Buenaventura in downtown Ventura, California, officially known as the City of San Buenaventura. 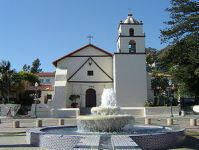 These historic and archaeological areas are one of only three Mission sites in historic downtown commercial business districts in California (the others being San Luis Obispo and San Gabriel). The other 18 sites were originally in rural areas located away from the pueblos and presidios In some cases development and tourism has overrun Mission sites, but these sites are not true downtown business districts as one sees in most communities. The sites of the Historic Park cover a wide range of locations from original buildings, excavated sites and open parkland, to lots occupied by later buildings. Even on those sites that have been occupied by later buildings, foundations of the original structures have been located. This web site represents a collection of various information on the park sites. Founded March 31, 1782 by Father Junipero Serra. Initial building was the San Miguel Chapel (site 8). The Mission chapel (site 10) was begun in 1792 and was later abandoned for the current site. Along with the chapel, the Inner (site 2) and Outer (site 3) Quadrangles were built as part of the Mission complex. A chronological listing printed by Thomas Tolley, in his Excavando Los Espiritus, which was the archeological project for the new Holy Cross School, is below. Table courtesy of Thomas Tolley from Tolley, Thomas E, Excavando Los Espititus: The Holy Cross School Archaeological Project, 2002. Historic pictures courtesy of San Buenaventura Heritage, Inc. the Museum of Ventura County and Thomas Tolley from Tolley, Thomas E, Excavando Los Espititus: The Holy Cross School Archaeological Project, 2002. The quadrangles were designed to create secure living spaces and working areas adjacent to the mission chapel. The Inner Quadrangle provided living quarters and other activities. The Outer Quadrangle, which was built later, provided more working areas for the mission complex. Kitsepawit (1839-1915) was a Chumash Indian (also known as Fernando Librado) who worked and lived around the mission during the mid 19th Century. From notes he left from the 1912-15 interviews, we have an idea how the quadrangles were organized. From these notes Thomas Tolley made diagrams of the North Quadrangle, now under the new Holy Cross School, and the Inner and Outer Quadrangles along Main Street. Tolley maps the North Quadrangle below. The Inner and Outer Quadrangle map is below. Charts courtesy of Thomas Tolley from Tolley, Thomas E, Excavando Los Espititus: The Holy Cross School Archaeological Project, 2002. Another map drawn in the late 19th Century, Museum of Ventura County Map M308 shows structures built prior November 8, 1869, with the mission buildings and orchard shown in hash marks below. The overlay of the current buildings is down below. The Tolley overlay was the wrong scale. Most people believe that the Quadrangle extends east as shown in red outline. Current buildings are shown in green outline and the alleys are in yellow outline. The Inner Quadrangle site currently has the mission grounds, living quarters, offices, the new Holy Cross School , and the museum-gift shop. The Outer Quadrangle site currently has a thrift shop and a parking lot. Map courtesy of Thomas Tolley from Tolley, Thomas E, Excavando Los Espititus: The Holy Cross School Archaeological Project, 2002. The parking lot at Palm and Main was excavated in the spring of 2011 by an archaeological team led by John Foster, which found the quadrangle foundation.The dig involved the south and east end of the Outer Quadrangle, a reverse “L” shape. The foundations were 3 feet deep. The buildings were believed built in the 1810s-20s, after the Inner Quadrangle was completed. Like the Inner Quadrangle, the Outer Quadrangle probably had a security element to it in addition to the workplace element, and may have been a response to the Chumash revolt of 1824. Inside the quadrangle was a courtyard with a circular structure of unknown use. It is believed that the courtyard held cattle and that some tanning process was going on. The most important find was the north section of the east quadrangle end which had the original tile floors. These original findings continued into the alley on the north and may go into the 71 Palms parking lot. Below is an architectural rendering by John Foster. Other parts of the quadrangle were unearthed during the construction of new Holy Cross School. See the Tolley book photographs for pictures of that excavation. The foundations of these water-related structures are across Main Street from the Mission and are under the c. 1877 Peiranos Building. Photos and a design of the Lavanderia are below. Designs courtesy of Roberta Greenwood and John Foster. These underground structures could be accessible with proper architectural design. They are also connect to the Mission aqueduct system (site 17). This expansive site covers several blocks. One of the largest garden areas of its kind in the Mission system, the foundation walls of the garden are in Mission Park and adjacent properties. This area was also served by the Mission aqueduct system. Parts of the garden and the wall could be reconstructed. Located in a small park at the southwest corner of Thompson and Palm are located the foundations of the first mission building built in 1782, which was reconstructed in 1819. As the Alfred Robinson plate in Tolley’s reproduction shows, the chapel was southeast of the mission and was still standing in 1829. The building remained standing until the mid-19th Century. The ruins were cleared in 1877. The southern branch of the aqueduct system ran by it on the north side of Thompson. The cemetery is now covered by the old Holy Cross School and a parking lot. The school was first built there in 1922. As this property can not be developed due to the presence of the burial grounds, the cemetery could be restored one day. The upper picture is the cover of Tolley’s Excavando Los Espiritus and the bottom picture courtesy of the Museum of Ventura County and San Buenaventura Heritage, Inc. This site, which includes the foundation of the earlier attempt to build a mission chapel overlaid with the foundations of later construction is part of the Albinger Archaeological Museum, now closed. Site of 1804-05 mission, which was abandoned in 1806 due to poor construction. Mits Kahn a Kahn village site constructed over it later and replaced the historic Shisholop site (site 14). then on to the Lavanderia-Fountain and then the San Miguel Chapel and Mission Garden. The aqueduct entered El Caballo from the line that ran down Cedar Street to the north. Built in 1857 three blocks west of the Mission. West half of the adobe washed away in the flood of 1866-67. Ortega Chile established there in 1897. The last of the known Main Street adobes still standing (other buildings on Main Street may have been originally adobes). On the hill above the mission in Serra Cross Park, which is a private park owned by the Serra Cross Conservancy. Original cross established by Father Serra. There were probably several crosses on the adjacent hills used to mark the settlement as well as for religious uses. The cross appears (just barely) on top of the highest hill in the 1829 Robinson print above. The current is the fourth cross, which was erected in 1941. The first cross stood from 1782 to 1861, the second from 1861 to 1877, and the third was erected in 1912. Site of a large native village at the bottom of Figueroa Street near the seashore. One of the largest villages on the Central Coast. Cited by Cabrillo in 1542 as El Pueblo de las Canoas, according to most historians. Also described by Vizcaino in 1602. Had 300 to 400 people, according to Portola in 1769, the expedition in which Serra also traveled. Village abandoned about 1805. West of the Shisholop site (site 14). On Harbor, just west of Figueroa. Near Amtrak platform. on the eastern ends of Vince, Lewis and Warner Streets on the Avenue. to the San Miguel Chapel (site 8), then west along the north side of Thompson to the south part of the Mission Garden. Much of these lines could be marked on the landscape.